There are usually no signs or symptoms of FH. You can have high cholesterol and cardiovascular disease and don’t realise you have FH because you feel well. You may only find out you have FH after you or another family member has a heart attack, stroke or other circulation problem. Sometimes there may be cholesterol deposits around the body. 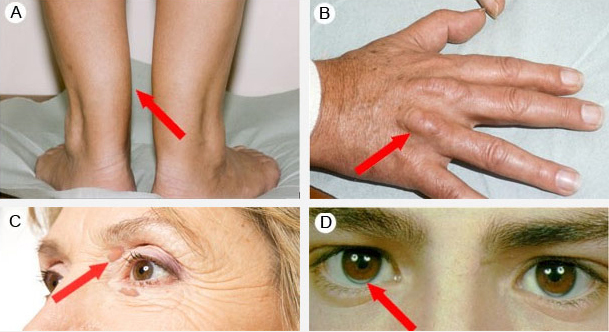 As shown in the figure below, the deposits usually occur on the tendons (tendon xanthomas), particularly on the Achilles tendon (A) and the extensor tendons of the hand (B), on the eyelids (palpebral xanthelasma) (C) and at the corneo-scleral junction (corneal arcus) (D). Genetic testing is voluntary and may affect, not only yours, but other members of your family’s future life insurance products policies. The full implications of genetic testing should be discussed with other family members before genetic testing is considered. If you require further information regarding genetic testing other than what your specialist has given you, a referral to a genetic counsellor will be provided. If you are the first person in a family to be suspected of having FH you are called the ‘index case’. You will be offered genetic testing to identify the specific LDL receptor gene mutation (or ‘faulty’ gene) which you may carry. Once identified other members of your family (only blood relatives) will be contacted* and offered genetic testing to see if they carry the gene mutation. All affected members of the family will have the same gene mutation. This process is called ‘cascade screening’. As FH runs in families this method generally identifies several other family members with FH. See How is FH inherited? and Typical family tree. Testing family members is crucial to see if they have inherited FH. Identifying the specific gene mutation is important as some mutations are more serious than others (there are over a 1,000 different types of LDL receptor mutations). This information will guide the doctor in deciding the intensity of your treatment along with your other risk factors and current medical history e.g. heart attacks, strokes and other circulation problems. Gene mutations are only identified in 75% (3 out of 4) of cases. When one is not identified it does not mean that you do not have FH, it may mean that the mutation has not yet been identified. *The index case can contact relatives directly or give permission for cascade screening program staff to contact them. Program staff contact relatives by letter, inviting them to attend the clinic for initial screening. Once diagnosed with FH, patients will have further tests for assessing the presence/amount of cardiovascular disease. Total cholesterol This is the total amount of cholesterol in the blood. A high level can increase the risk of cardiovascular disease. LDL The ‘bad’ cholesterol. High levels cause plaque to buildup in the arteries, increasing the risk of cardiovascular disease. HDL The ‘good’ cholesterol. It carries away cholesterol, reducing the risk of cardiovascular disease. Triglycerides Triglycerides are another type of fat in the blood. High levels of triglycerides in the blood increase the risk of cardiovascular disease. High levels can also be a sign of diabetes, metabolic syndrome and other conditions. Lipid profile Includes total cholesterol, LDL, HDL and triglycerides. CK When muscle is damaged it releases CK into the bloodstream. Higher than normal levels of CK suggest muscle damage e.g. heart attack or statin side effects. Apo B Apo B is the major protein found in LDL cholesterol. High levels of Apo B indicate an increased risk of cardiovascular disease. New research suggests Apo B may be a better overall marker of cardiovascular risk than LDL cholesterol. Apo A1 Apo A1 is the major protein found in HDL cholesterol. Low levels of Apo A1 indicate an increased risk of cardiovascular disease. or Lp(a) Lp(a) is a genetic variation of LDL cholesterol. Lp(a) is determined by genes and is not generally affected by lifestyle or medication. Lp(a) is not well understood but high levels are associated with increased risk of cardiovascular disease. Severe cases may be offered Lipoprotein apheresis. C-reactive protein (CRP) CRP is a protein produced in the liver as part of the body’s response to inflammation (injury or infection). Inflammation plays a major role in the process of atherosclerosis. A high CRP indicates inflammation somewhere in the body. Full Blood Count (FBC) FBC is a series of tests that measures the haemoglobin, red blood cells, white blood cells and platelets. FBC checks for anaemia and infections. Urea Electrolytes and Creatinine (UEC) This group of tests measures how well the kidneys are working. ALT & AST ALT and AST is performed to detect liver inflammation or damage e.g. from statins, alcohol and some diseases. Fasting glucose Fasting glucose is performed to diagnose diabetes or pre-diabetes. Haemoglobin A1c (HbA1c) HbA1c shows the average amount of glucose in the blood over a three month period. HbA1c is used to check how stable glucose levels have been. TSH TSH is measured to check thyroid function which show if the thyroid is underactive or overactive. 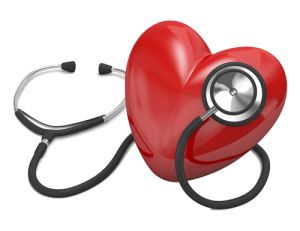 High or low levels of TSH can alter the normal functioning of the heart e.g. heart palpitations, very slow or fast heart rate.